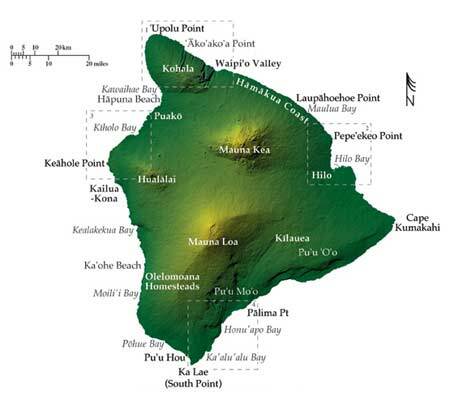 The island of Hawaii is referred to as the “Big Island” for its massive size. With an area of over 4,000 square miles, it is larger than all of the other main Hawaiian Islands combined. Truly a destination for everyone, the Big Island is home to eleven of the world’s fourteen ecosystems. With over 300 miles of coastline, the beaches offer something for everyone as well. Most of the islands resorts are located on the western coast, from Hapuna Bay to Waikoloa to the north on the Kohala Coast and down through Kailua-Kona in the south. In the course of one day visitors to the Big Island can be standing directly over flowing lava in Volcano’s National Park to star gazing in sub-freezing temperatures on top of Mauna Kea. 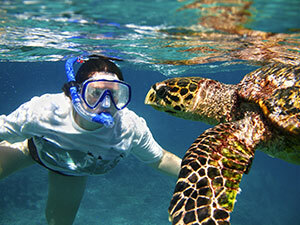 Water lovers are also greeted with endless possibilities for surfing, scuba diving, fishing or just relaxing. Read more. Mauna Kea is the islands highest peak at just over 14,000 feet and is also the worlds tallest mountain, taller than Mt. Everest when measured from the sea floor. The island is comprised of five separate shield volcanoes and Kilauea, located in Volcanoes National Park, has been continuously erupting since 1983. Mauna Loa is another active volcano in the same national park and because of the active lava flow this island is still growing in size. Of all the Hawaiian islands, Hawaii is the one least known for its surfing beaches. Access to most surf spots requires a 4x4 vehicle and/or some helpful local knowledge. There are a number of great surf spots on the island of course, but finding them is another story. On the western side of the island in the town of Kona is a popular spot called Banyans. This is where professional surfer Shane Dorian grew up surfing and this is a hollow right and left reef break. Another fun spot just south of the Kona airport is Pine Trees. This is a fun right hand break that is perfect for surfers of all skill levels. On the east side near Hilo is a break called Honolii. This break is a fast, hollow river mouth break that is best in the winter months. So, no matter what type of activity you are looking for in the state of Hawaii, the Big Island will certainly cater to your needs. Whether it’s snorkeling, hiking, fishing, diving, surfing or just relaxing at one of the many luxury resorts you find whatever it is you need on this amazing island. See less. Presented by Surfline, this camera overlooks the surf spot known as Banyans. This reef break is mostly a right, but the lefts can be fun as well. Camera overlooks the beaches of Kawaihae and popular surf spots around the area. Provided by Surfline, viewers will see 30 seconds of live streaming video. Surfline members will see continuous streaming video. Enjoy breathtaking views of the Kona Coast on the Big Island of Hawaii from the Sheraton Keauhou Bay Resort and Spa. Viewers can have control of the camera for up to 3 minutes. Property Network on the Big Island presents this street side camera allowing viewers to see the ocean and sidewalks in downtown Kona. This camera allows outsiders to see everyday life in Hawaii from their own computer. Camera allows viewers to see live the spectacular rocky coast of Waikoloa Beach at Hali'i Kai. Camera is offered by the Waikoloa Beach Resort. Presented by the Hilton Hotels, this camera features views of ocean view terrace, oceanside cabanas, Buddha Point, Waiulua Bay, south towards Kona. Presented by the Pacific Tsunami Museum, this rooftop view shows the beauty and serenity of Hilo Bay. Copyright © Live Surf Cam Hawaii, 2007-2014. All Rights Reserved.